When these alien-like stalks start poking through the dirt, you know that spring has really arrived. Here are eight ways to use this delicious vegetable. Grill. Asparagus become deliciously smoky and charred with just a quick visit to the grill. Marinate the spears in a mayonnaise-based dressing to create a beautiful blistered crust or serve them chef Mario Batali’s way—topped with a super-rich zabaglione. Pickles. Make a quick dill brine, add the asparagus and refrigerate overnight. Boom—the world’s best Bloody Mary garnish. Pesto. In this take on a classic sauce, the asparagus gets incorporated while it’s raw, so use the sweetest spring spears you can find. For dipping. 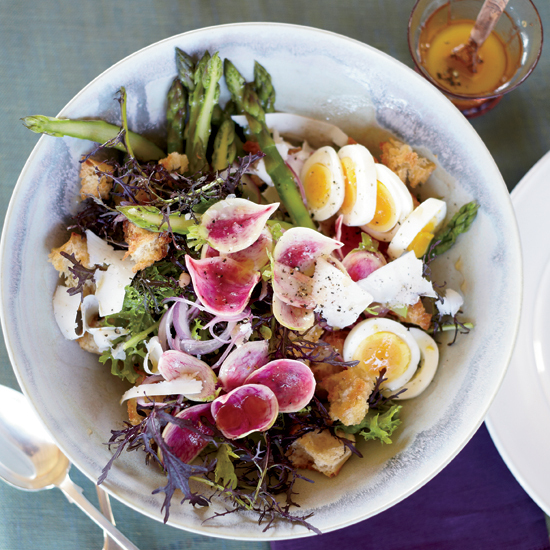 Blanch asparagus until it’s just barely tender, then dip it in the yolks of soft-boiled eggs or in lemony homemade mayonnaise. Sandwich. Instead of the usual grilled zucchini or eggplant, use charred asparagus as the base of your sandwich filling. Layer it with some goat cheese or try this more complex sandwich with a smoky French dressing. Pizza. Roast or char asparagus and then use the spears on top of a white pizza. Salads. Use fat spears in a springy version of panzanella (the Italian bread salad) or shave them for a raw slaw. Or, for an even healthier version of the Middle Eastern salad tabbouleh, add blanched asparagus that’s been finely chopped in the food processor. Risotto. For a double hit of asparagus flavor, infuse the stock with asparagus trimmings then add the chopped spears just a few minutes before serving.